Did you know that Freightos can help you comply with Cargo 2000, Phase II? Before we get to that, let’s take a second to refresh your memory. In 1996, forward-thinking members of the Air Cargo Forum looked at the state of air shipping and knew that something was wrong. The success of air shipping owes itself to the speed and reliability that it provides, together with outstanding customer support. The Air Cargo Forum members knew that freight technology was crucial to improving customer satisfaction, increasing efficiency and reducing costs. And so, Cargo 2000 was created. 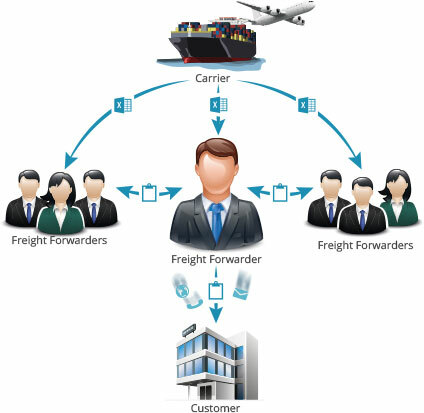 Sponsored by IATA but run by C2K (very actively – there are monthly reports on the organization’s website), Cargo 2000 seeks to introduce electronic planning and measuring into door to door air shipping, reducing the number of processes involved. How does Cargo 2000 Work? In order to shorten processes, Cargo 2000 reduced the number of steps required to ship air cargo from 40 steps to only 19. Each step is carefully documented in the Master Operating Plan, available on the Cargo 2000 website. What’s so awesome about Cargo 2000? These are clearly game-changing ideas, which is why if you fast-forward to today, the number Cargo 2000 compliant companies has sky-rocketed. In mid-May, China Southern joined the list of major airlines supporting Cargo 2000. Together with the latest member, 88 of the world’s largest airlines and forwarders (including major global 3PLs like Agility and Panalpina) are now implementing the standard. Freightos and Cargo 2000? Embrace 21st century freight. Freightos can supercharge your 3PL by providing automated quoting, real-time sales management and customer-facing solutions that make your operations more efficient and cost-effective. As a matter of fact, independent forwarders using Freightos have seen ROIs of up to 1200% in only months. As you recall, the second phase of Cargo 2000 requires automated processes for planning (and implementing) shipments. Freightos can generate instant door-to-door quotes with powerful automated algorithms, providing multiple options for routing, complete with timing and full cost breakdown. Which means that you can be that much closer to being Cargo 2000 Phase II compliant. The best part? Cargo 2000 may focus on air shipping…but Freightos is fully multi-modal. And since Freightos also integrates simply with your TMS of choice, you can make sure that the instant quotes you or your clients generate with Freightos is passed on to your software of choice. Ready to see how Freightos can help you up your win-rate, reduce your cost of sale and make you Cargo 2000 compliant? Try a free demo now!